Consumer Confidence Jumps To Pre-Recession Level, Survey Shows : The Two-Way The rise could spell good news for the economy if it means the crucial holiday shopping season will bring strong sales for retailers. It also might be an indicator of how voters will be feeling when they go to the polls. 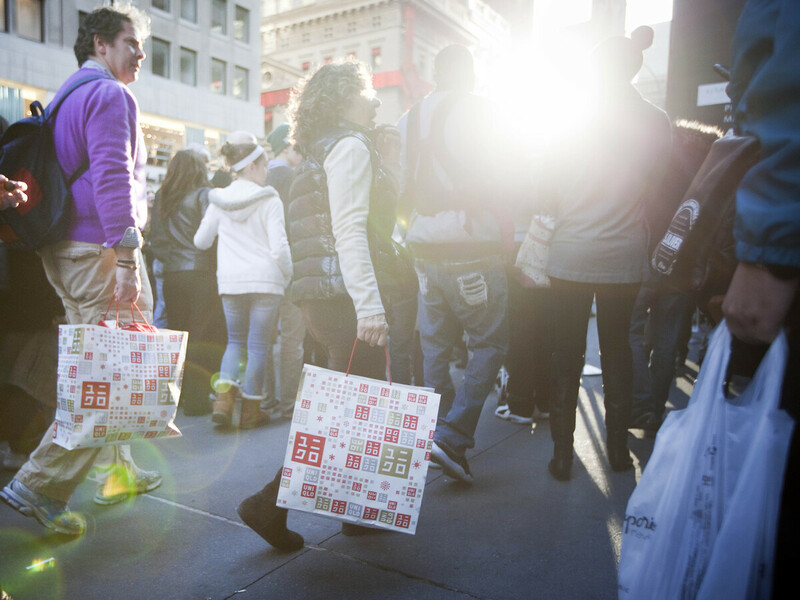 "Black Friday" 2011 in Manhattan: Retailers hope to see shoppers out again in force this holiday season. If confidence stays high, they may get their wish. "U.S. consumer sentiment unexpectedly rose to its highest in five years in October as consumers became more optimistic about the economy in a possible boost to President Obama's reelection hopes," Reuters reports. According to the wire service, "the Thomson Reuters/University of Michigan's preliminary October reading on the overall index on consumer sentiment came in at 83.1, up from 78.3 the month before, and the highest since September 2007, the survey showed on Friday." The U.S. economy officially slid into recession in December 2007. It officially came out of that downturn in Spring 2009. Bloomberg News adds that "rising stock and property values along with falling joblessness may keep giving Americans a psychological boost, brightening the household-spending outlook during the year-end holidays. Improving confidence may play a role in next month's election as Republican challenger Mitt Romney tries to make a case for unseating President Barack Obama, a Democrat." The confidence survey follows other hopeful economic indicators in the past week: a sharp drop in jobless claims, and a dip in the nation's unemployment rate.